I'm so excited to have a fabulous giveaway for you today with Red Apple Lipstick! I've been wearing lipsticks from Red Apple for almost a year now, and have never been disappointed. I love that all of their products are fresh, mineral-based, and vegan...and they contain no gluten, soy, petroleum, dairy, harsh chemicals or GMOs. Oh, and all of their lipsticks contain Vitamin E to moisturize your lips, and it so works! Top right: The boldest and brightest orange - 'Sunkissed'. I love the creamy texture! Lipsticks L to R: Sunkissed, Push Pop, Firefly. Gloss: Fuzzy Navel. Note: these products were a gift to me from Red Apple Lipstick. However, this is a brand I genuinely love, and all endorsements & descriptions of products voiced in this post are my personal opinions. Super cute post! I love that lipstick on you! Want to try their lipsticks so much! I have 3 lipsticks and they are great. I'm a fan of the rally balm too! those are some really pretty colors! I love the chapstick from Red Apple Lipstick. I use it every day, I definitely need another one of these! You look adorable! Beautiful hair! I would wait for a new collection, and use my GC on that! Love this lipstick on you, thanks for the giveaway. I would get a few different chapsticks...I am always in need of chapstick and theres seem so quality! Beautiful as always! 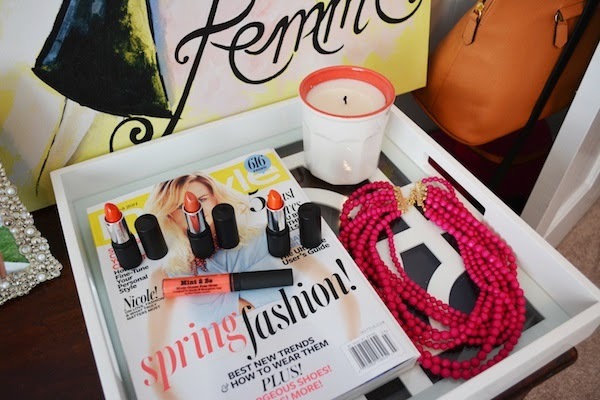 Loving orange lipsticks too! 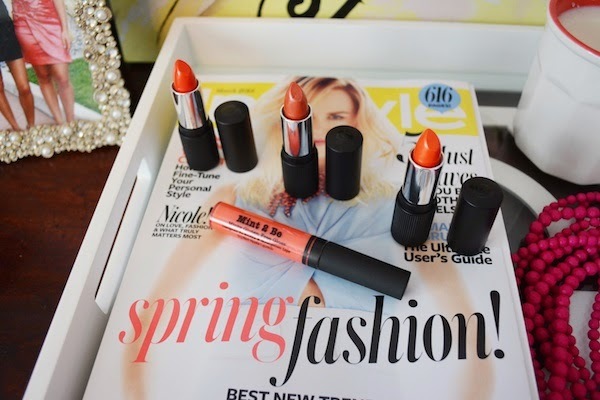 I've been loving Orange lipsticks! Love the fact that these lipsticks and vegan and they sound very well made. The colours look so pretty on you and this is a brilliant idea for a giveaway! Your thoughts mean very much to me, thanks for stopping by. All the lip colors look great on you! 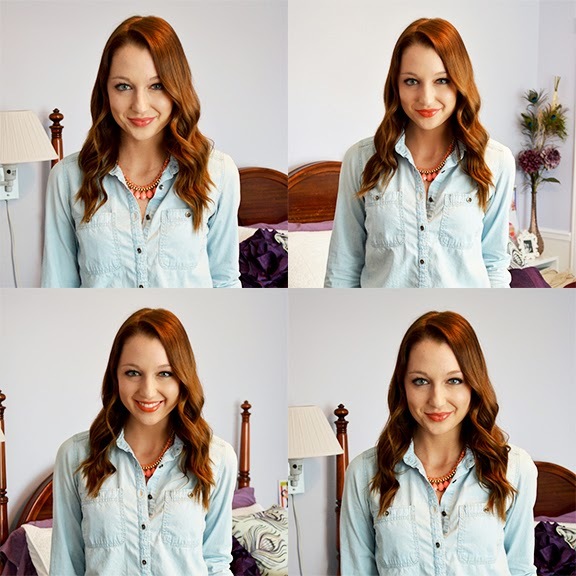 I've been searching for the perfect berry color all winter long! RAL is my favorite go-to makeup. It keeps my lips so healthy and looking good! Great pictures above! I just bought my first lipsticks from Red Apple and LOVE them! If I win, I would try the new high definition lip gloss in "Bashful," or maybe the new eyeliner! Oh, what a great giveaway! I'm so up for some new lipgloss, fun! I would love either the fuzzy naval or push pop! I've got a thing for lipstick right now and am eager to try something more on the orange side and a deep gothic like purple! Buuuut sugar, sugar looks like a super cute shade of pink I need! Hehehe! I love Red Apple lipstick. I would wear it even if I wasn't gluten free because it is so moisturizing and the color pigments last. My favorite is probably Strawberry, but I have been playing with Coral Crush for some orange this Spring. Newly found RAL and dying to try some gorgeous lipsticks! I would probably do the buy 2 lipsticks get the 3rd half off deal! I've wanted to try this so bad! Just not in the budget right now so this would be awesome! Thanks for the chance! I'd probably buy a new lipstick for spring and the new mascara they're making! I would definitely get the both the Sunkissed or Fuzzy Navel. I've only recently started experimenting with lipstick, and I think those two would work best with my skin tone. I'd love to try the Rallye balm, Exfoliate stick and the Lovebird lipstick looks like such a great colour! Thank you so much for offering such a wonderful giveaway. I would buy the Exfoliate Stick and Queen Of Hearts lipgloss. I would buy the gluten free eyeliner pencil! You've inspired me to try orange! I tell gluten free and Paleo friends about Red Apple! I love that Firefly lipstick, and I'd definitely get some eye shadow, not certain of the shade, as my preferences are different every day, So it would be what ever I like that day, lol! Love the rally balm, lipstick and eye liner so far. Can't wait to try more!! I've been dying to try their Honeybadger lipgloss and New York lippie! I would get Push Pop for myself and another color for my best friend - who has to have gluten free products. Thanks for the giveaway! I love spring collection right now, Beach Peach is a must have!